Dell UltraSharp 32 8K Monitor: UP3218K Visuals that rival real life. Experience realistic images like never before on the award-winning, world’s first 31.5" 8K monitor featuring Dell PremierColor. An unparalleled visual experience: Immaculate 8K resolution brings you images that redefine realism. Dell PremierColor: Exceptional for color professionals. Tackle color-critical jobs with everything you need - wide color coverage, incredible depth, precise color and customizable parameters. 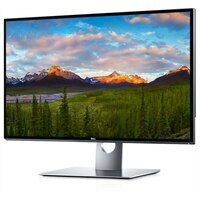 Beautiful and functional: This monitor is crafted to outshine and outperform, with Dell’s InfinityEdge display and stylish aluminum finishing. Visuals that rival real life.